May is apparently oatmeal cookie month, at least for me! I found this week’s recipe in “The Clever Cook“, by Lucy Doncaster, which is a wonderful cookbook that I can spend far too much time with just staring at the pictures. So I though I’d make some of my own! 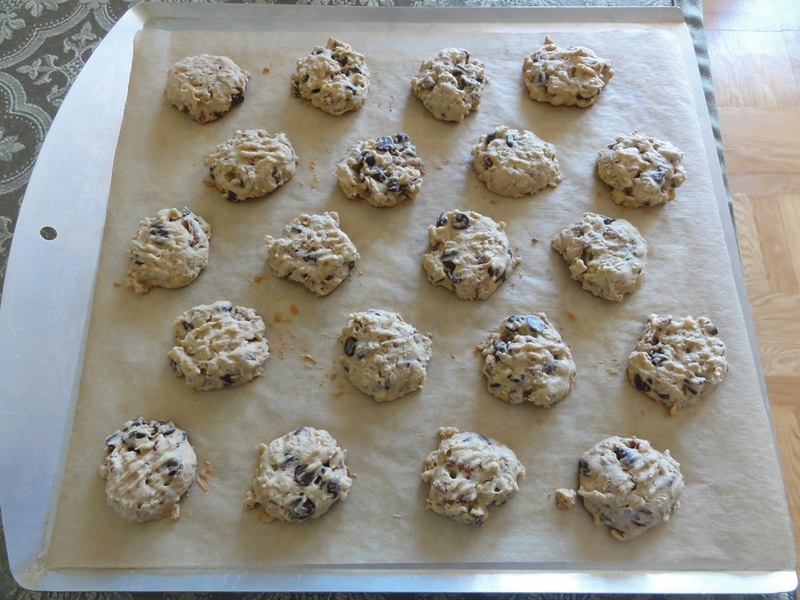 The hour in the fridge to chill, in addition to waiting for the butter to soften, means that making these cookies takes some planning. 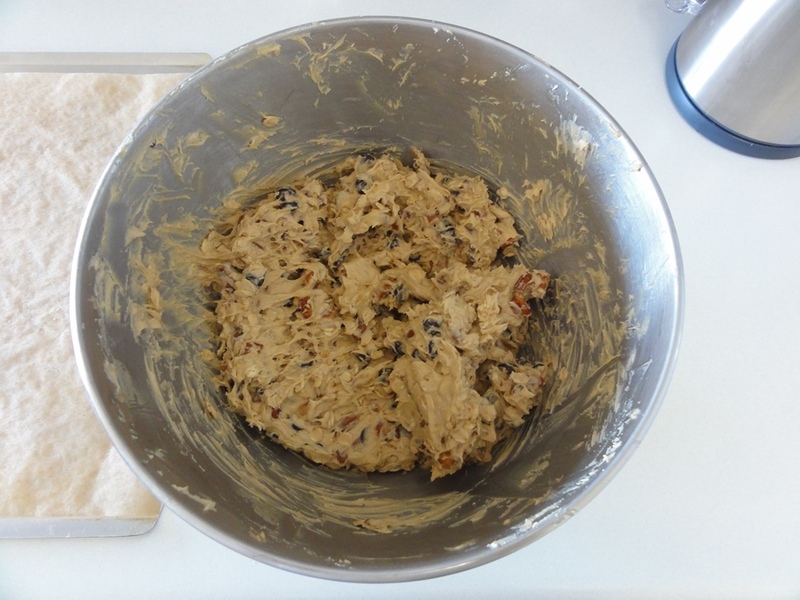 Once underway they’re easy to prepare and the hour in the fridge makes the dough very easy to work with. The end result is very satisfying and worth the wait! 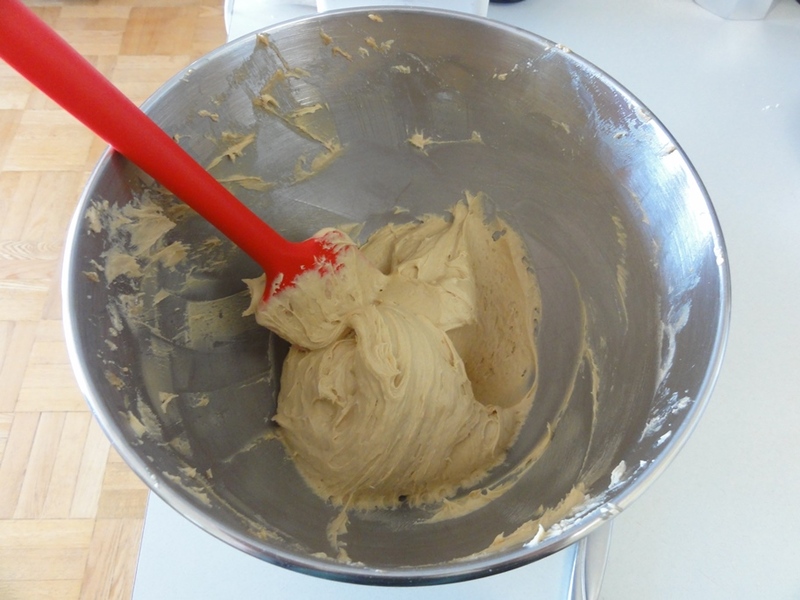 Cream butter and sugar until fluffy; about two or three minutes on medium speed. 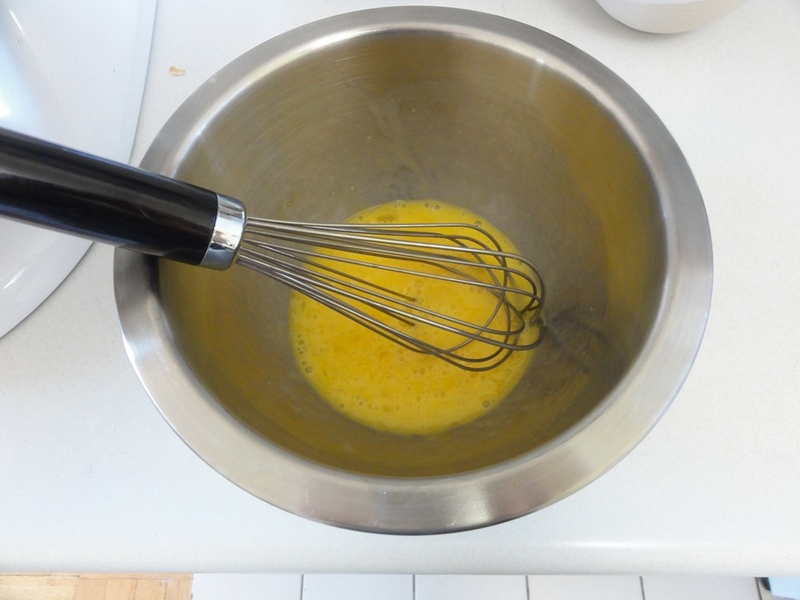 Add beaten eggs, milk, and vanilla, and beat thoroughly; about four or five minutes on low-medium speed until the mixture is consistent. 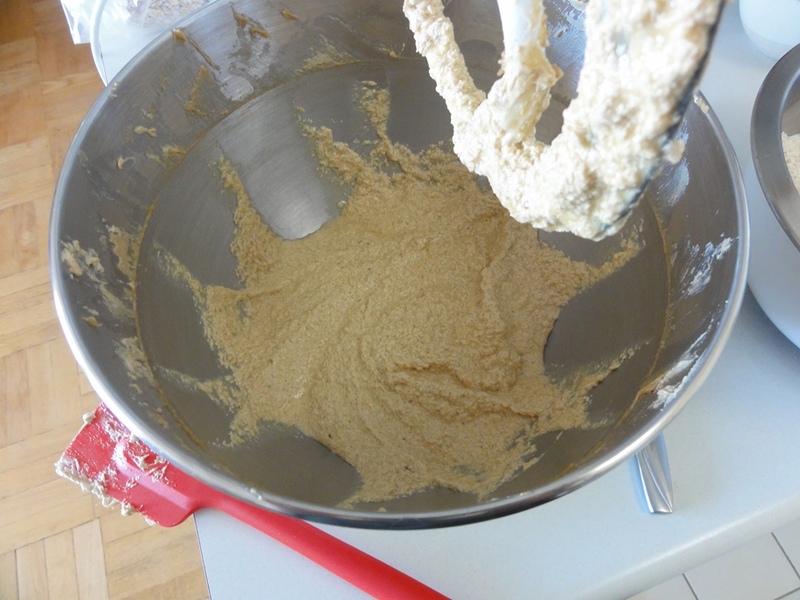 Sift in flour, baking powder, and salt, and mix thoroughly. 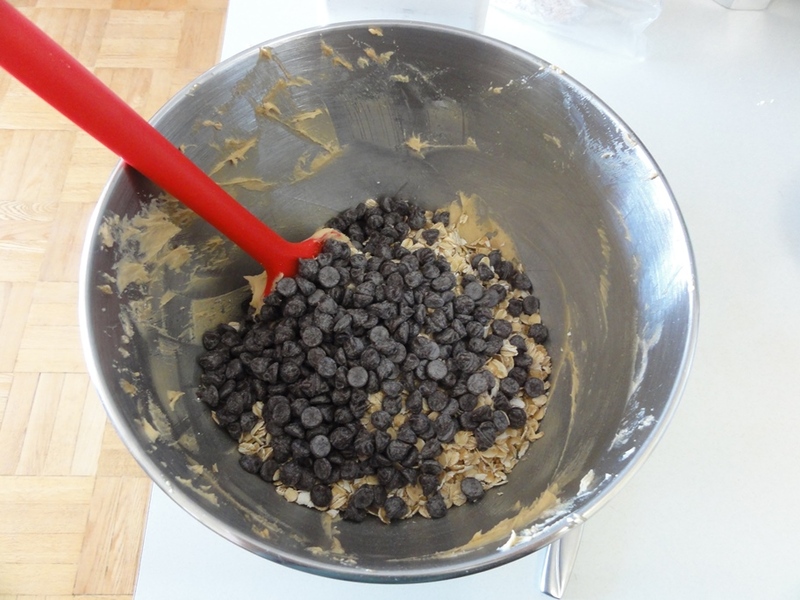 Fold in rolled oats, chocolate chips, and pecans. Chill mixture in the fridge for at least one hour. 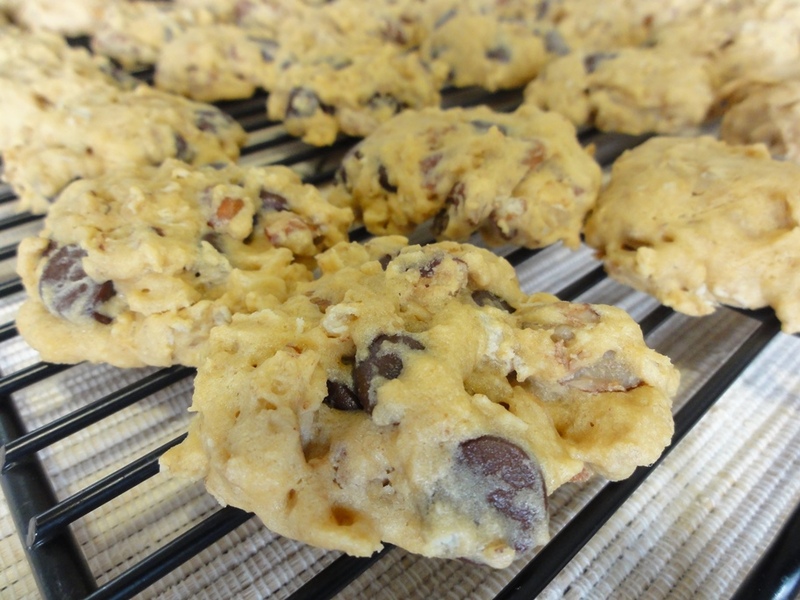 Place tablespoon-sized drops of dough onto lined cookie sheets and flatten slightly with a fork. Bake for 10-12 minutes, let sit on the trays for 5-10 minutes, and then cool on wire racks. One of the things I like about these cookies is that they’re not overly sweet. 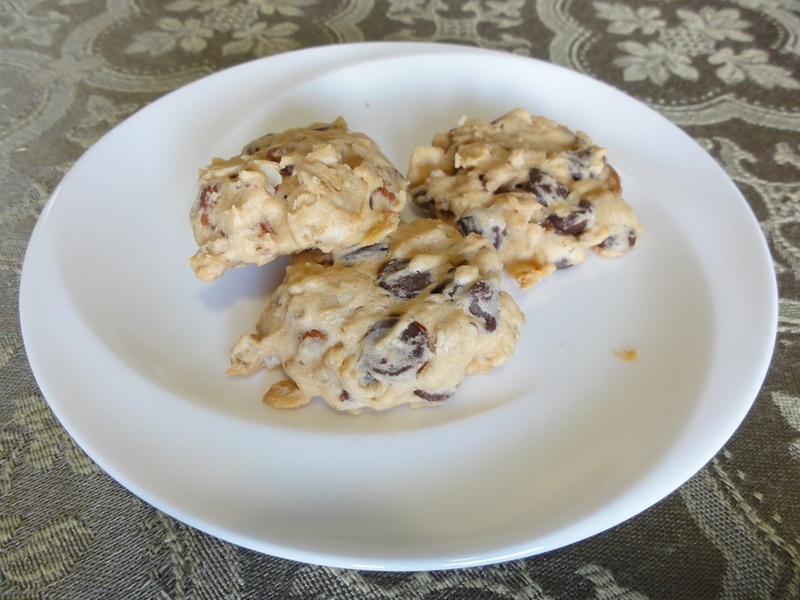 There’s nothing wrong with rich, gooey, chocolate-y cookies, but these can be eaten somewhat less guiltily given that there’s relatively speaking not a lot of sugar per cookie. Bittersweet chocolate chips would help to bring the sugar down even further. 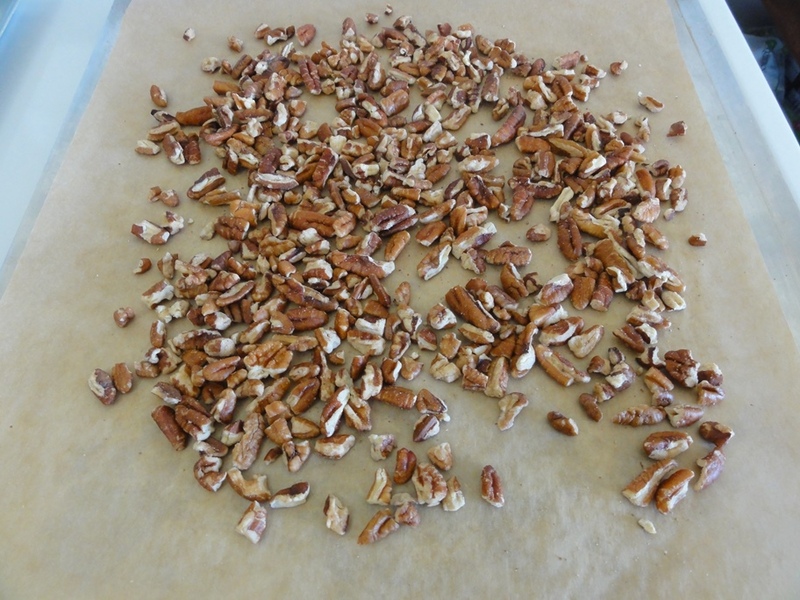 Five to seven minutes at 350°F and you have toasted pecans! Action shot of creaming butter and sugar! Lightly beaten will take you just to the point of a vaguely consistent color; there no need to get a workout beating up the eggs. After adding the eggs, milk, and vanilla, what you get does not look appetizing, but it gets better in a minute. 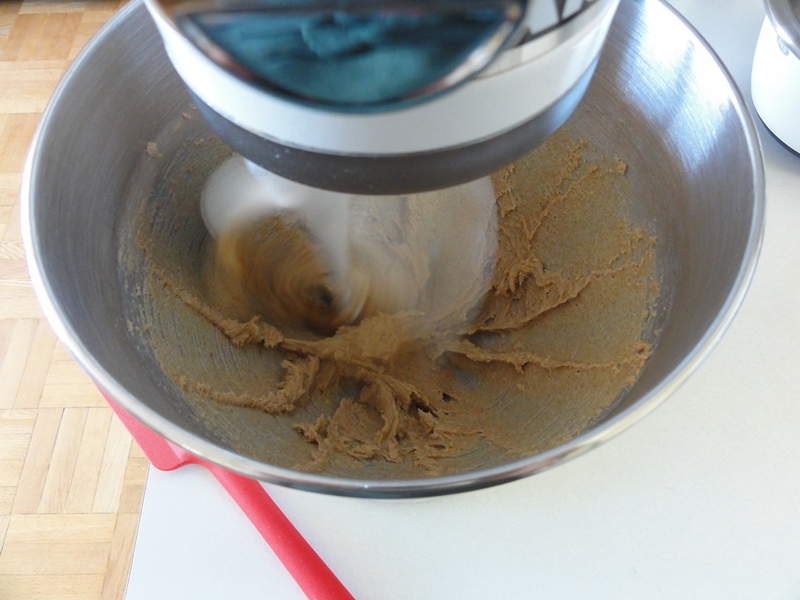 If you can’t get this step to even out into anything vaguely consistent, and what you have looks like soaked cornflakes, try whisking with a stand mixer or electric hand-held on a medium or medium-high speed and it should smooth out into something resembling this. 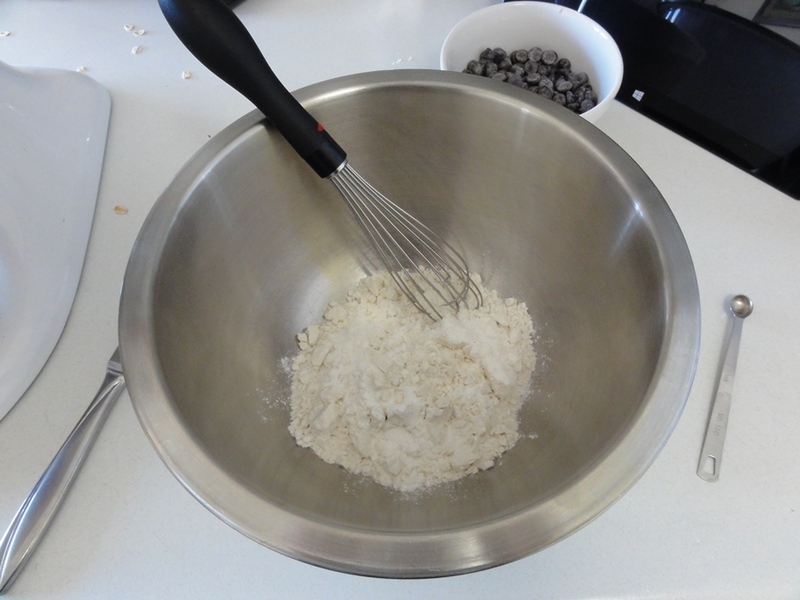 The mixture will thicken in a hurry when you dump the dry ingredients in, so it’s a good idea to whisk this part together first to ensure an even distribution of the baking powder. Once the flour’s mixed this starts to look better. Now we’re definitely getting somewhere! An hour in the fridge sets the dough up and makes it easy to work with, and for me is also a convenient time to clean up the mess I’ve made by this point. These cookies don’t spread out much; I could have fit 25 on one sheet. 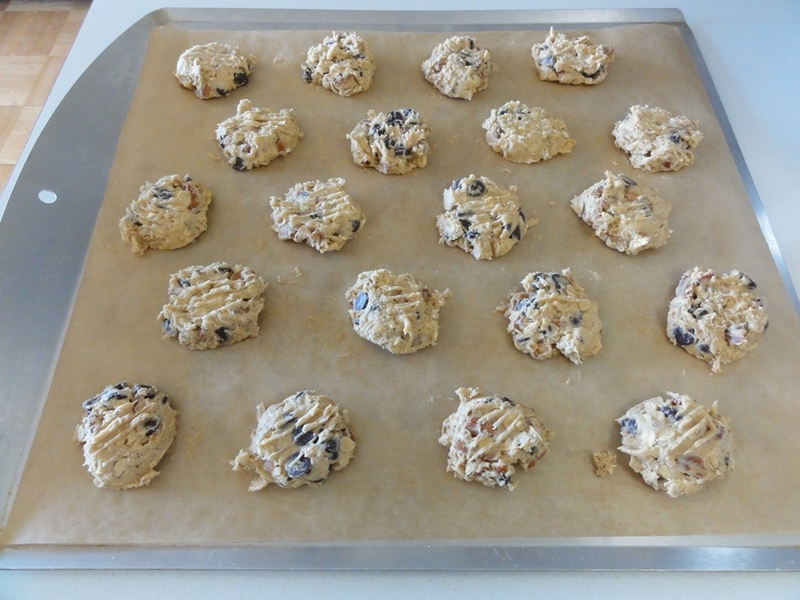 When they’re done they’ll be a little spongy; firmer than your average cookie. Now it’s time to eat them!